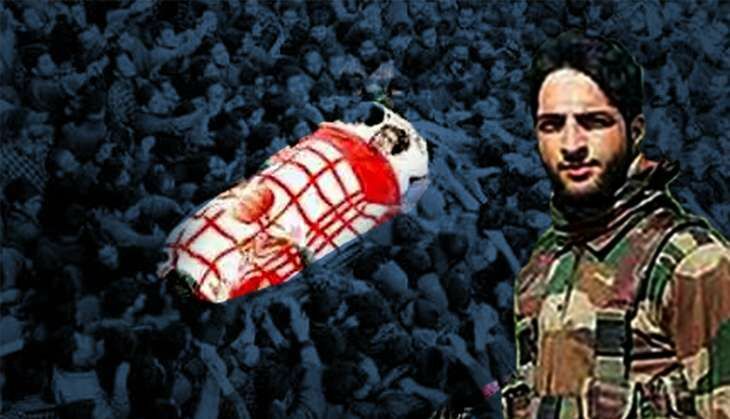 Home » POV » Burhan Wani in life and death: an icon for Kashmir's Gen Next? Burhan Wani in life and death: an icon for Kashmir's Gen Next? What do Burhan Wani and Ashfaq Majeed have in common? How will the narrative change post Burhan\'s death? How does Burhan bring the legend of Ashfaq Majeed back to life? Burhan Wani - the young militant from Kashmir who had gained iconic status among the vale's Gen Next - is no more. Wani was killed in what the police have called an "encounter". A heavy pall of gloom and a dense, emotionally fraught condition hangs over Kashmir after his death. If a parallel may be drawn here or a metaphor employed, it seems that a wound has been reopened in Kashmir's heart and collective consciousness. This is evident and writ large on the visages of people and the outpouring of grief across the length and breadth of Kashmir. There is another parallel at work here: while for the Gen Next of Kashmir, Wani was iconic and an emblem of their aspirations and emotional calculus, for the older cohort of Kashmiris incubated in the eighties and nineties, Wani's death brings about a deju vu. It recalls the legend and death of another young Kashmiri - Ashfaq Majeed Wani. A common strand runs through both Burhan's and Ashfaq Majeed's life trajectories and death. Both represented and reflected the deepest yearnings and aspirations of the Kashmiris. And both were inspirational for a vast majority of the people. Eerily, both were in their twenties when they gained iconic status and also died. While this is sheer coincidence but a pattern can be discerned here: both were emblematic and products of the conflict in and over Kashmir. And given that both chose to rebel against the existing order, the people of Kashmir sublimated and projected their deepest yearnings onto them. Both the Wanis' exploits accorded a vicarious thrill to Kashmiris in terms of resisting against the historical narratives of the state, sticking their neck out and placing themselves in mortal danger and their willingness to pay the highest price for Kashmir. Both Ashfaq and Burhan are no more now. Does this mean that the conflict in and over Kashmir will be over? Or more importantly, would the sentiment that undergirds the conflict be given short shrift? Will Burhan's death mean the end of the game? Again, we might employ the trajectory of Ashfaq Majeed to illustrate the nature of the issue and the inspirational dynamic behind it. Ashfaq motivated and inspired thousands of Kashmiris to take to the gun and this led to a full blown, wide-spread insurgency in Kashmir. While the military aspect of the insurgency has been contained by the state, the sentiment that drives it remains as strong as ever. The context that gave rise to Ashfaq Majeed was different in the sense that the conflict was not entirely militarised, the phenomenon of Burhan emerged after the militarisation of the conflict and the whittling of militancy in terms of numbers. But both were, and still remain, inspirational. While the state, for who Burhan's popularity was a thorn in its flesh, may be rejoicing his death, it stands to reason that Burhan's death, like Ashfaq's may turn out to be a motivating factor for Kashmir's Gen Next to take up the gun. This generation is on the cusp of dilemmas and is conflicted. The inner conflict and turbulence of this generation lends itself to the context, sentiment determined by the conflict. That is, their consciousness - collective and individual, emotional worlds and aspirational dynamics is structured by conflict. This, in our opinion, is likely to get stronger by and after Burhan's death. In the larger scheme of things, the implications and consequences are clear: Kashmir will get caught deeper into the vortex of conflict and the younger generation of Kashmiris' heroes will be people like Ashfaq Majeed and Burhan Wani. The deaths of both feeds into the collective conscious and unconscious of Kashmiris and makes the real political narrative only stronger. In this sense then, Burhan's death may not be the end, but in all likelihood, will constitute a new and fresh impetus to militancy in Kashmir. The views expressed here are personal and do not necessarily reflect those of the organisation. TWEET THIS Burhan Wani's death and what it means for Kashmir What do Burhan Wani and Ashfaq Majeed have in common?